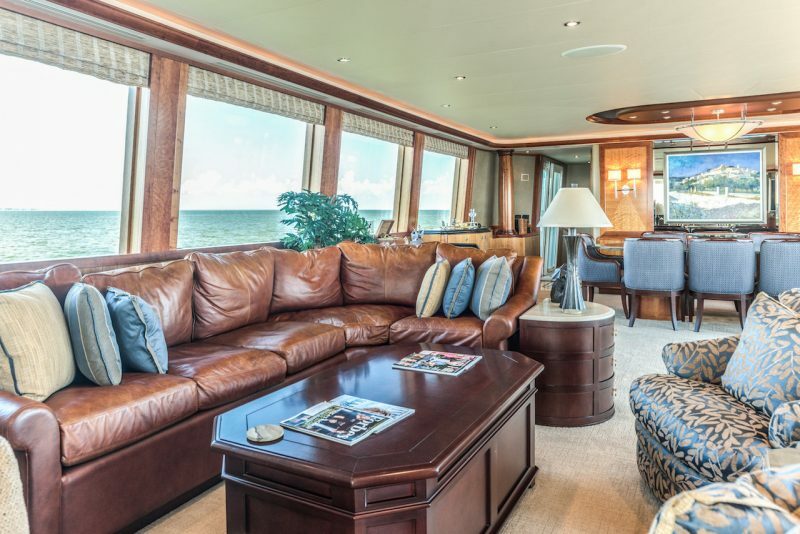 Relax in a glamorous conservatory-like setting on the M/Y Lady Raye yacht, a superb 112′ Westport. 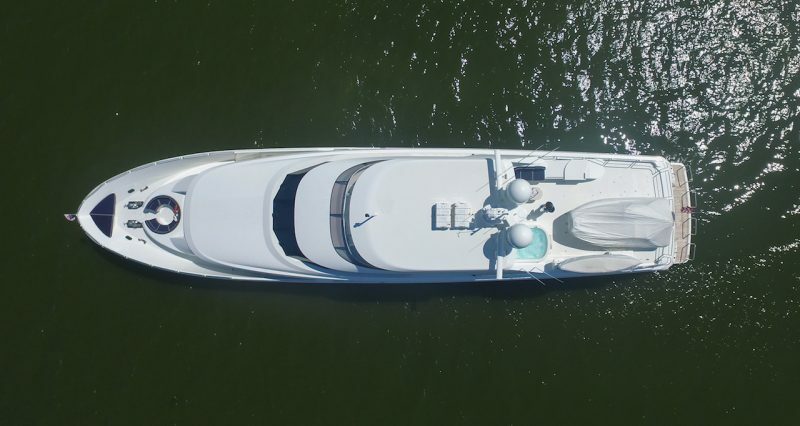 Every superyacht has something that makes them special, yet on Lady Raye there are several features that make this yacht stand out from the crowd. 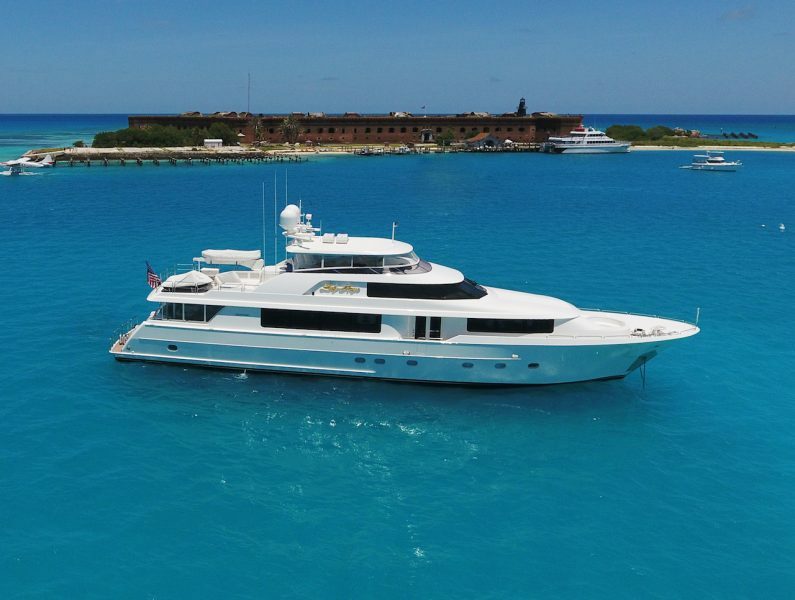 This stunning Westport 112′ (34.14m) was launched in 2005, yet local cruising and private use have kept the engine hours extremely low, giving it the sale condition of a much younger and immaculately cared for yacht. 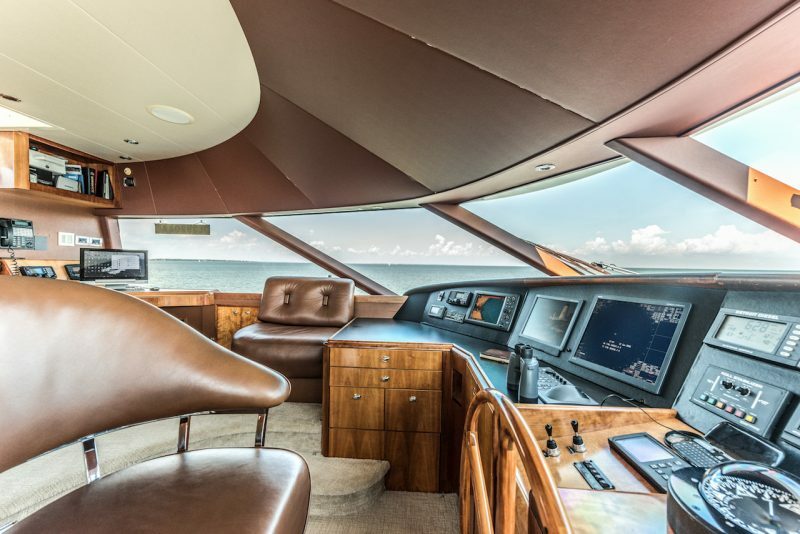 But that’s not all that makes this yacht unusual and extremely attractive to the savvy buyer. 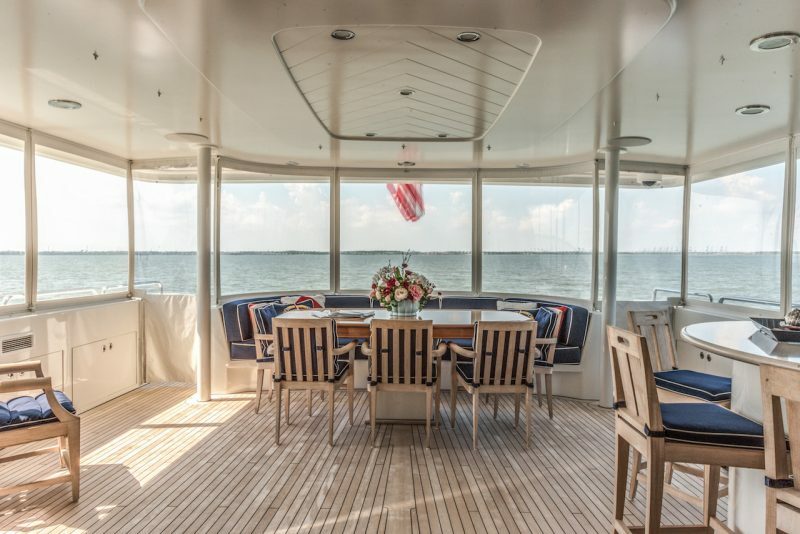 One of the most striking features of M/Y Lady Raye is the enclosed, air-conditioned aft deck, with wrap-around glass windows on three sides lending this space the feeling of a glamorous conservatory. Of course, instead of looking out on a garden, you look out on the sparkling sea, waving palm trees, and exotic ports. 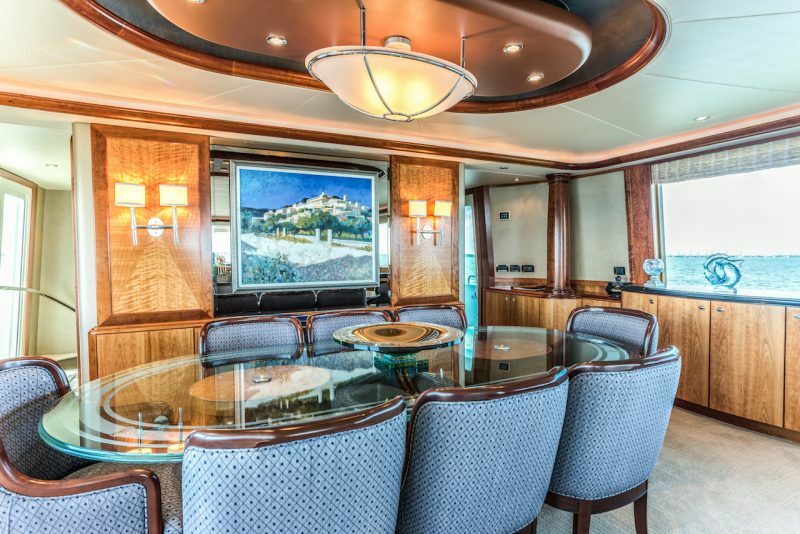 This all-weather space has a dining table for elegant meals out on deck, as well as a bar with stools for watching the crew make the perfect cocktail or iced tea to enjoy after a swim. 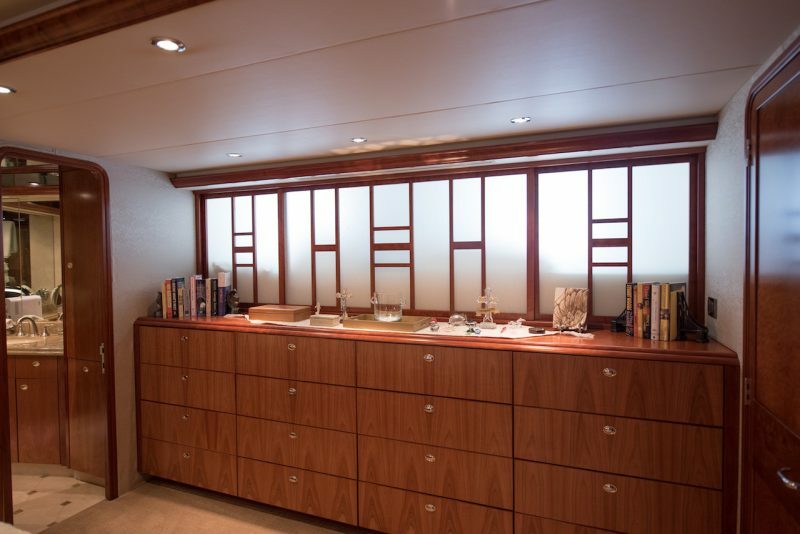 The unique feature of a glass-enclosed aft deck not only allows guests to spend their days on deck in all weathers and in cool comfort, but it also dramatically extends the interior space of the yacht when the door leading into the main salon are left open, creating one huge indoor-outdoor living space. The salon is bright and airy, with huge windows and soft lounges for relaxing with friends or watching a big game on the widescreen TV. The elegant cherrywood panelling and fine fabrics give this room an elegant yet deeply comfortable feel, and there’s also an adjoining dining room for more formal occasions, as well as a sensational country kitchen with soft leather booth seating and a breakfast bar so you can watch the chef at work. Lady Raye accommodates up to eight guests in four spacious staterooms, which are organised in an attractive layout on the lower deck. The full-beam master cabin is a testament to light and elegance, with removable shoji screens allowing soft light to flood into the cabin. 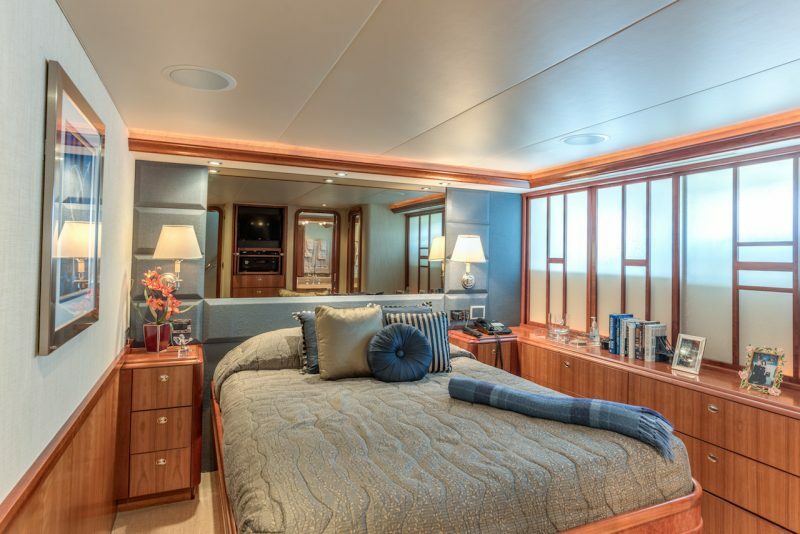 The master stateroom features a California King bed, soft sofa seating, a walk-in wardrobe, and a stylish his and hers bathroom with a Jacuzzi and a marble and tempered glass shower. 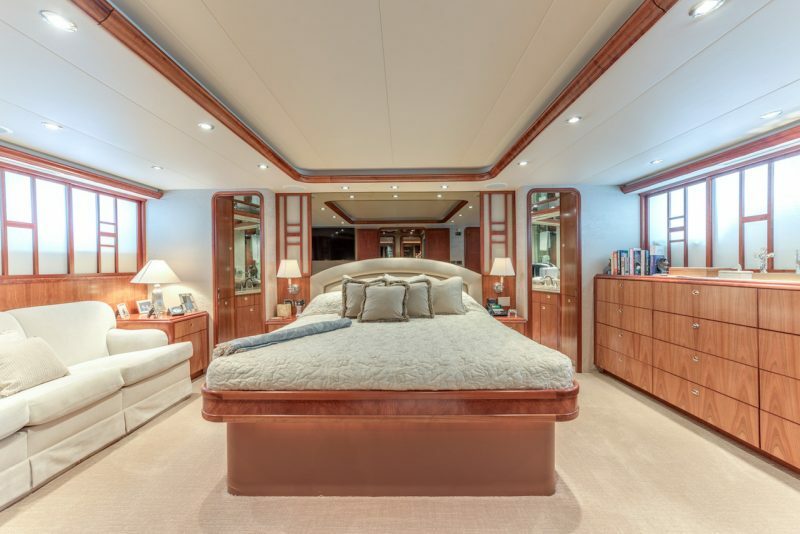 There’s also a VIP stateroom with Queen bed and couch seating, a spacious Queen cabin, and a twin cabin, all with well-appointed en-suite bathrooms. 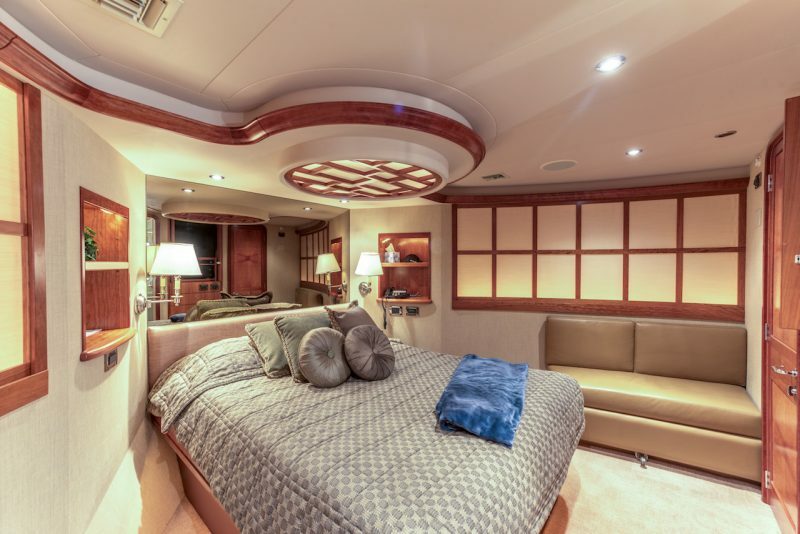 This cabin configuration will suit either private or charter use extremely well. 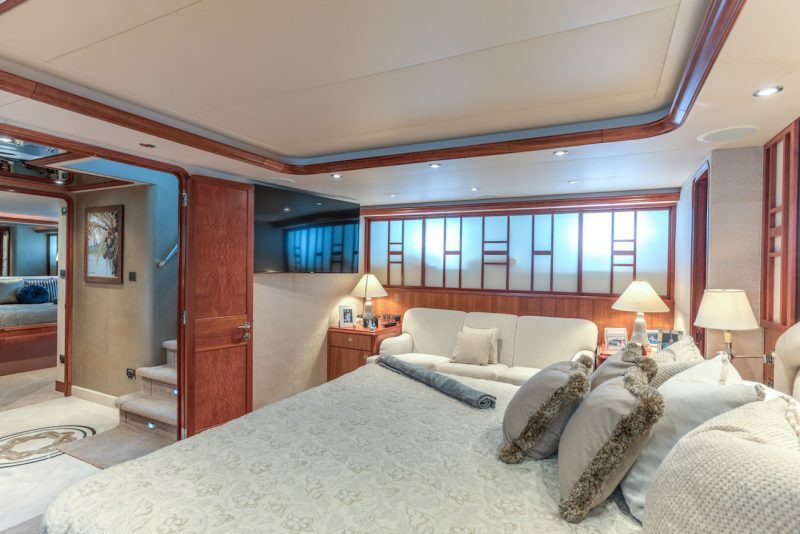 Lady Raye also has sensational deck spaces, with an expansive flybridge that proves perfect for entertaining. 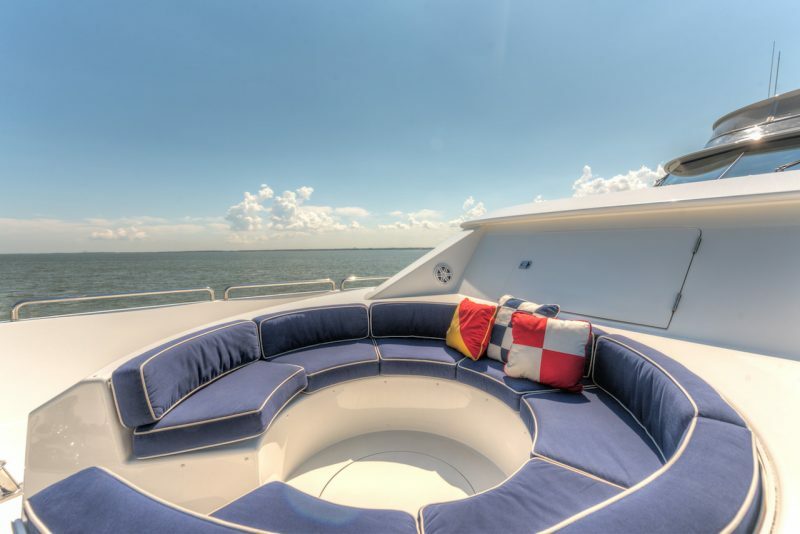 Up forward near the helm, the flybridge is shaded and enclosed on three sides, with lounge seating in a smart nautical theme of navy and white piping. There’s a bar with stools and a barbeque for happy afternoons at anchor, perhaps with the chef grilling up the morning’s catch. 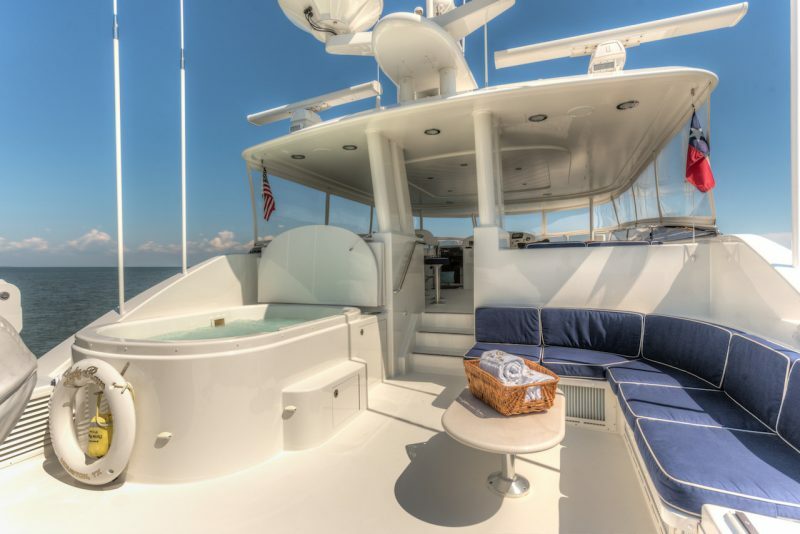 Moving aft, the flybridge then opens up to a sunny, beautiful sunbathing area with lounge area and raised Jacuzzi offering splendid views of sky and sea. 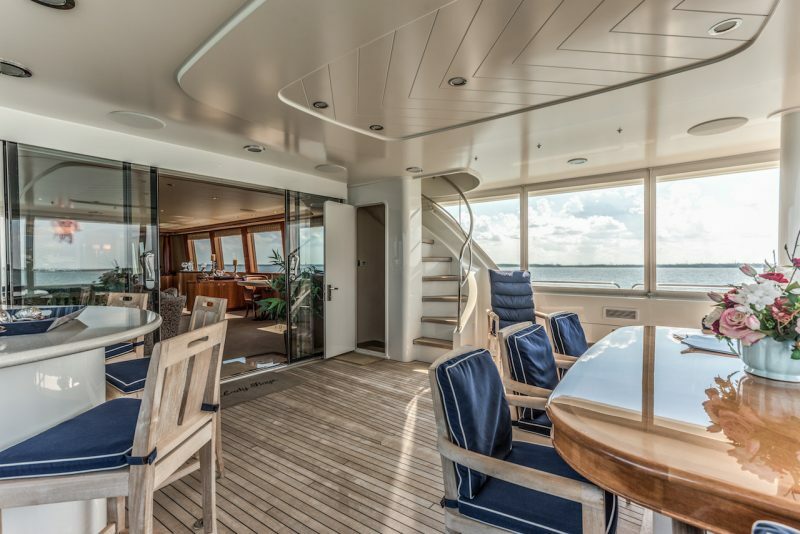 For sun worshippers, there’s also a beautiful circular lounge area on the foredeck for enjoying stunning views while underway or at anchor. There are in-built speakers and an entertainment control here so you can enjoy some music as you enjoy sunset cocktails and canapés, or just soak up the sunshine. 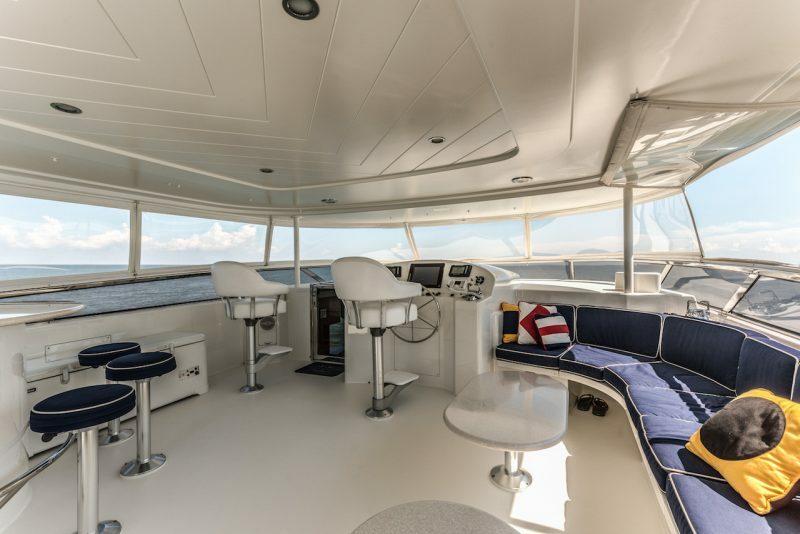 You can even take a cushioned seat right up on the bow; a great place for reading a book on calm days, or watching over the bow as dolphins jump and play in the bow wave when underway. Lady Raye also has a fantastic swim platform, which is reached by two gently spiralling staircases leading down from the aft deck. This is the perfect place to sunbathe after a refreshing swim, or launch off on one of the yacht’s watertoys. Lady Raye is a quality American built luxury yacht which can reach speeds of 24 knots from two MTU/DDC 16V2000 engines, with only 4035 hrs logged as of September 2016. Recent yard periods have updated this yacht’s paintwork, interior features and machinery, ensuring that Lady Raye goes to her new owner in a marvellous and exceedingly clean condition. 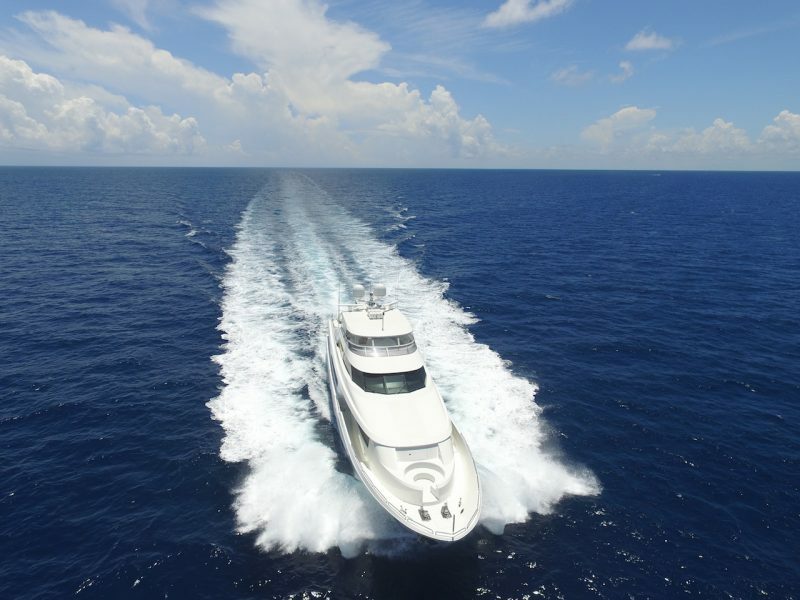 M/Y Lady Raye is listed for sale through Worth Avenue Yachts for $5,900,000 USD, and is currently located in Fort Lauderdale, Florida.